Come experience the vibrant lifestyle of downtown St. Petersburg in this Designer curated 8th floor Signature Place Condominium. This residence offers 2 bedrooms and 2 baths split floor plan with 1269 square feet of luxury living. Beautiful COREtec vinyl floors throughout the living room and the bedrooms. The kitchen features custom designer backsplash new cooktop and hood stainless steel appliances complete with warming drawer modern cabinetry with custom moldings quartz counter tops and an island with quartz waterfall sides. Custom made barn door at the Master Suite entry. Master suite includes large walk in closet master bath with dual vanity sinks separate glass shower and garden tub. Custom LED lighting upgrades and designer wallpaper through out the condo. Designer Curated furnishings. Enjoy the large balcony with views of Tampa Bay to the gulf the pier location the Yacht Basin Al Lang Stadium Dali Museum Albert Whitted Airport and the Sunshine Skyway Bridge. 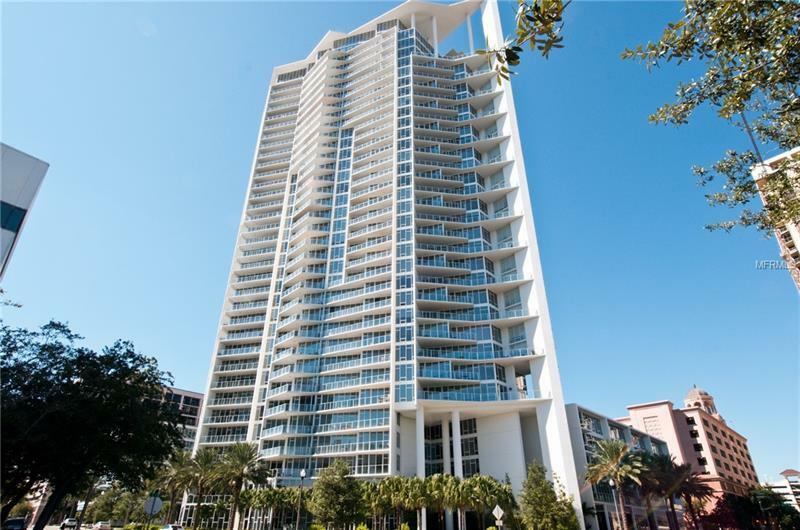 Signature Place is located in the heart of downtown St. Petersburg and is one of the most iconic condo buildings known for its modern architectural appeal. Amenities include spacious state of the art Fitness center 24 hour concierge large heated pool private cabanas Spa and 2 club house rooms. Walk to all your favorite restaurants museums art galleries Beach Drive Bay front parks Vinoy concerts in the park and much more. 2 Parking spaces and 1 storage cage.